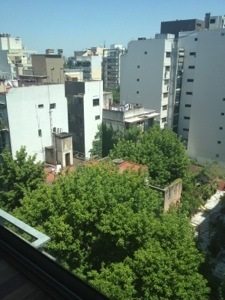 I’ve now been in Buenos Aires for 2 weeks, which is pretty crazy given how much I’ve packed in during that time. 3 weeks from today I head to Mendoza so time is (relatively) growing short. If I was at home, 3 weeks would seem to be a pretty short time period. If I was on vacation, 3 weeks would seem like an eternity compared to most vacations. In this weird hybrid of work/play, it feels like both. One of the things I’ve learned since I’ve been here is that I need to treat it like a marathon, not a sprint. That means I can’t, for example, have huge meals every night as I’m here just way too long to keep up that pace. Last night I cooked something simple for myself and the night before, it was no meat. I’m also moderating any alcohol intake (not that I’d be getting wasted anyway) and generally trying to treat my schedule like I was actually at home. A big sign for me that I’m now essentially embedded in this great town is that I’m not thinking to take pictures. This, of course, makes for a dull looking blog so I will be making up for it over the next few days. However, I now feel like a local, going to work, walking to go get groceries and occasionally going out to eat. I like that feeling and it’s necessary to ensure my stomach and liver survive this experience. Posted on January 10, 2013 by reyalto. Bookmark the permalink.